MOZART: Concerto No. 24 in C minor, KV491 composed by Wolfgang Amadeus Mozart (1756-1791). For piano. Instrumental Solo Part and CD. 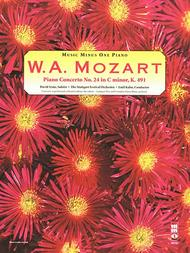 Published by Music Minus One (MO.MMOCD3016).ISBN 1596150130.Brilliantly written for the instrument, this C-minor concerto is unusual when compared to most other Mozart concerti. A passionate work filled with originality, Mozart employs his largest orchestra, utilizing woodwinds extensively, giving a beautiful effect. Highly recommended.Includes a high-quality printed solo part (with orchestral reduction) and a compact disc containing a complete version with soloist, in split-channel stereo (soloist on the right channel); then a second version in full stereo of the orchestral accompaniment, minus the soloist.